Enamels give the boat its finish, but also a protective barrier against sun, salinity and water. For some years now the products on the market have added important aesthetic values (metallic, changing etc.) to their increasingly improved technical characteristics. It isn't just a question of looks. Because greater porosity makes a surface more vulnerable to attack by dirt - which can penetrate more deeply - and especially by atmospheric agents. In a tough marine environment this easily leads to yellowing and dulling of the surfaces. But the exterior aspect is not secondary, and increasingly greater customer satisfaction can be achieved with research into special subtleties - metallic, micalised and even changing colours - to be matched with the superstructure or with deck accessories that can be done in the same shade. One of the advantages of enamels is in fact the possibility of using tintometric systems developed for car bodywork which makes it easier to find the right colour for any retouching. The choice of product for finishing the hull is therefore a delicate step. And if this is true for all boats, it is especially true for superyachts, and not only in consideration of the economic question. These boats, much less frequently laid up and rarely under cover, are objectively more exposed. Moreover, the cost of any renovation required due to poorly executed paintwork cycles or to the application of unsuitable products can be very high indeed. Until not so long ago it was said of enamels that they didn't last long, they got dull, were easily scratched or altered. Today paintwork has evolved into the application of actual cycles of specific products that achieve flexibility, great brightness and - why not? - top aesthetic quality. The professional cycle for a big yacht involves undercoat, a sprayed plaster jacket, another undercoat, an under-enamel coat and lastly the finish with two coats of enamel. A coat of transparent acrylic for further protection can be applied as an optional. Precisely in this sector Boero, a traditional Italian company well known worldwide, has intensified its research, exploiting the experience gained with 430 superyachts over the last twenty years. 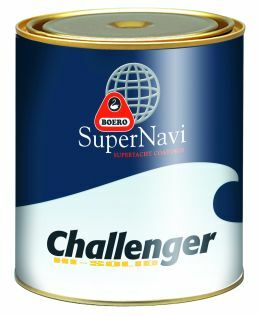 The result is Challenger Hi-Solid, the new product of the SuperNavi line, which will shortly be launched on the market. It's a completely new concept high-solid enamel specifically for maxi yachts, the fruit of 4 years of ad hoc study in collaboration with prestigious Italian and foreign research laboratories. The debut of this line marks a step forward for Boero and completes the painting cycle offered by the company. So the customer can choose all the products from the same company - a full package - with obvious advantages both in terms of costs and simplification of supply. Challenger HS operates in different directions: technical evolution of course, but without forgetting the aesthetic aspect and environmental safeguarding. From the first viewpoint we should mention duration, chemical resistance and the low solvent content, a detail of considerable importance in the application phase. Special care has been taken at the aesthetic level, with 2.000 colours available and no less than 15.000 combinations of customised shades created by the tintometric system and sent directly to the customer within a very brief time schedule. The range goes from classic pastel through metallic finishes to 500 metallic, pearled and changing shades. The latter are increasingly used and substantially contribute to a successful aesthetic design result. Application of the film offers a matt, gloss or non-slip finish. Hi Solid has the merit of corresponding to the tough European Union VOC standards on emissions, which come into force on 1st January 2007. These standards are in fact obligatory only for the industry and vehicle bodywork sectors and therefore do not concern shipyards, but Boero's involvement marks a new company philosophy aimed at the development of low environmental impact products. 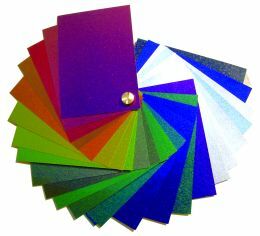 To go into detail, Challenger is a bicomponent enamel of an acrylic nature which can be polished and treated with abrasive paste to improve finish or regain colour. It is especially suitable for spray application and has high filling qualities and considerable covering power while permitting thick coats with a reduced risk of dripping. The advised base is polyurethane or epoxy. The dry thickness per coat is 50-70 microns, with an average theoretical yield of 11 square metres per litre. Drying to touch takes 6-7 hours with a minimum of 24 hours for polishing and 7 days for the complete screen. The litre/square metre specification, at 50 microns, shows a 40% saving on materials. The product has been tested under various environmental conditions in Florida, New Zealand and Europe. For information: Boero Colori Divisione Yacht Paint; 16121 Genoa (Italy); Via Macaggi; 19; Tel. +39 010 55001; Fax +39 010 5500207; web site www.boero.it.